"I felt like I was dreaming and laughing." These letters were written by first and second graders. We've taken the liberty of making a few spelling adjustments. 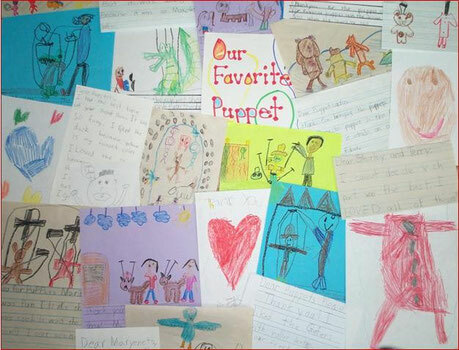 "Thank you for the great and terrific and funny puppet show. It was the best puppet show in the world." to be his horse! And the skunk because she thought I was a weed!" "Thank you for the hilarious puppet show. My favorite was the dogs and everything was cool!!!" "My favorite was the frog and the doctor dog and the boy dog and the girl dog and the fox and the dinosaur and the donut dude and the bear and the boy squirrel and the girl squirrel and the duck in the boots." "I like you and the goat and the boy puppy. "My favorite was the walking candy because they had donuts and ice cream for heads." I want to eat your nose." "I liked you two acting out with your puppets and I'm going to make a picture for you with your puppets and you two making the puppets move with sticks and string." "Thank you for making the puppets do funny things." "My favorite one is the skating one but it was freaking me out because it was so making me laugh." "I like the monkey on the scooter because she was doing a wheelie." "My favorite parts were when the bear chased his underwear and when the cowboy rode us and the doctor and the wonderful sound effects." "I liked the duck because yellow is my favorite color." "My favorite is the bear and the dogs and the skating one and the buggy huggy. Well I can't pick." "I like the birds. I liked when the birds flied. I liked the teddy bear. I liked the frog." "I liked it a lot. The funny little bug jumped on my little brother that sat on my lap. Have a happy day." "I like the bear who chased his underwear that was funny and I laughed so hard." "Thank you for Puppets Please. My favorite puppet was all of them." "How do you make your fingers go so fast?"